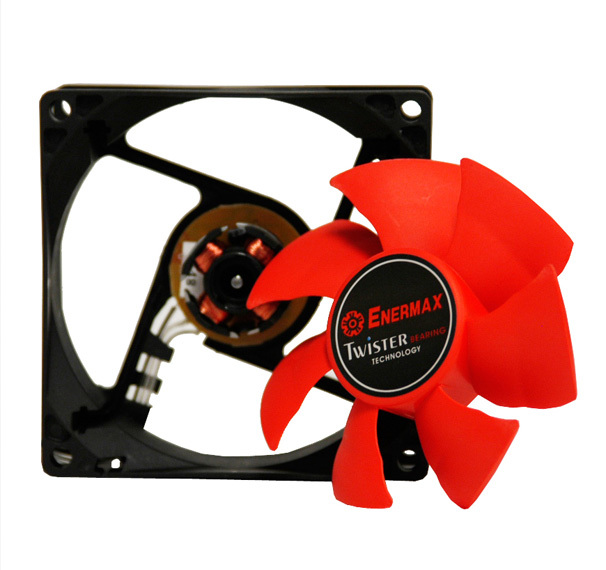 With it's hot red blades and revolutionary new bearing design, the Enermax MAGMA 80mm Twister Bearing Case Fan is here to inject a bit more style and dynamic cooling into your PC. Offering double the lifespan of traditional 2-ball bearing fans, the Enermax MAGMA uses it's new Twister Bearing Technology to enhance cooling, providing an Extreme Operation Temperature of 85C (for over 100,000 hours). In addition, it's Batwing Blade Design is capable of providing an extra 20% ~ 30% of airflow. As an added bonus, the blades are detachable and easy to clean. For enhanced safety and performance, the Enermax MAGMA 80mm Twister Bearing Case Fan also comes with sleeved cables to prevent any wires from cluttering up your system.